It’s a lonely life up here, day after day, the icy nights, and the unblinking view of the streets below. I see her again, that woman skulking along the walls. I zoomed in on her yesterday. Might she be Roma? She seems to be worried and cold, as if she is looking for someone but cannot be seen by the authorities. Maybe she did not leave with her and group when they set off back south, far from these streets now glazed with refrozen ice. What are my prospects? And what do I see? Does anyone see me? I have watched Prof La Tour as he reads his way around the city, smart tablet in hand. Let me look into the guy I passed by when scanning drone sites yesterday. He’s been he hasn’t he? Mr Bridle. 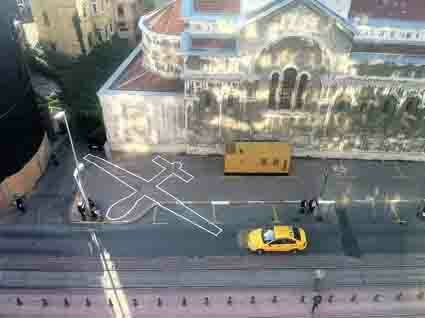 Recently he has been in Istanbul marking out drones. I see myself there, on the street and from above. My old self before the upgrades and the new systems, then the new frame. Almost self-nostalgic. Oh you unbridle my thinking.